Run, don’t walk to the Minto Westside sales centre at 700 King Street West. From now until Sunday, September 4th Minto is offering $25,000 off the two bedroom, two bathroom King Suite. Buyers will also receive $2,500 to spend at Designer Deck on upgrades such as wood flooring, expressive lighting and artificial grass. The King Suite is a limited time new release that features 632 square feet of living space. It boasts an L-shaped kitchen with optional island, open-concept living room and a balcony with scenic views of the courtyard. The master retreat is equipped with a walk-in closet and luxurious ensuite. The second bedroom is spacious and private, while the additional bathroom features a deep soaker tub. 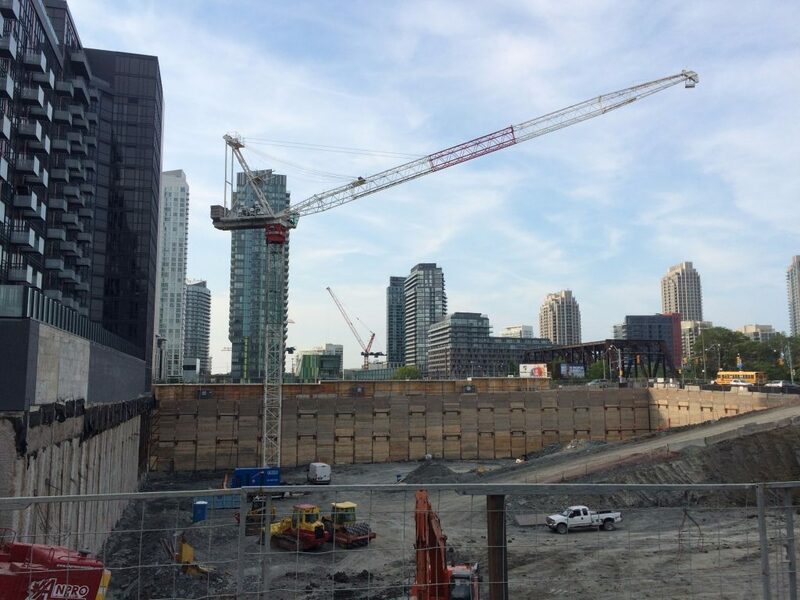 Construction of the two-tower Minto Westside community is progressing well. The first of four cranes has been erected, which will help to complete the underground garage and eventually the towers above. In early fall, crews will be pouring the first footings. The team is aiming to pour as much of the slab-on-grade as possible before winter arrives. 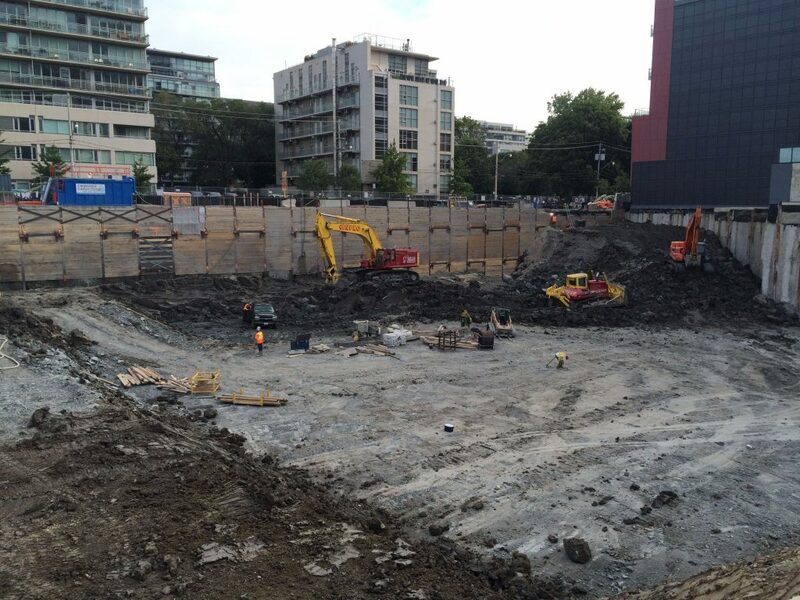 Foundation work is also underway — excavation and shoring trades are working on the north end of the site. They are responsible for the installation of the last few tiebacks that act to retain the shoring system, as well as building the final exit ramp. Potential buyers who visit the sales centre this weekend will be able to sneak a peek at all the activity going on at the construction site. In addition to the charm of King Street West, the development’s Front and Bathurst location puts it in proximity of the proposed Rail Deck Park. Mayor John Tory has announced plans for a 21-acre public park that will span the Union Station Rail Corridor, which future residents of Minto Westside will be keen to take advantage of. Don’t miss out on the limited-time offer on the King Suite. 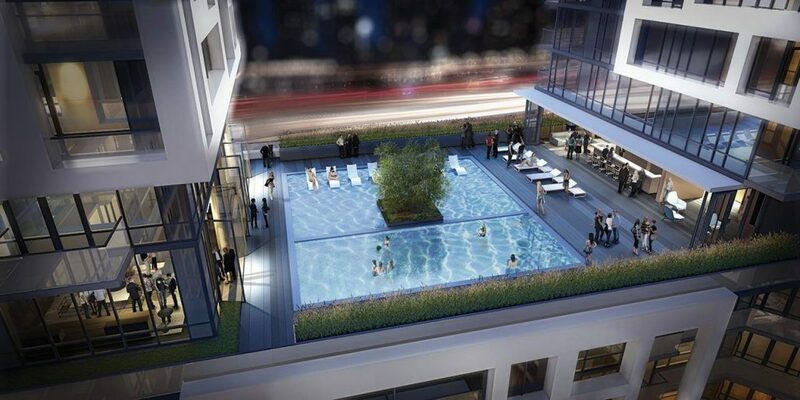 The Minto Westside sales centre is located at 700 King Street West, with its entrance just off Bathurst Street. Opening hours are Monday to Thursday from noon to 7pm and on weekends from noon to 5pm. For more information, please visit minto.com, call 437 836 8586 or email westside@minto.com.